est. 1792 and named in honour of Allan Ramsay (1684-1758) - the celebrated Scots poet. Dating from 1792 this 'coaching' inn is located in the former weavers' village of Carlops, nestled at the foot of the Pentland Hills. Situated alongside the A702 road it is conveniently located only 20 minutes from Edinburgh. This historic inn retains its 18th Century character with antique decorations, a small library, charming candle-lit restaurant and real log fires. The hotel has four comfortable guests rooms (ensuite) on the upper floor which offer single, double, twin and family occupancy options. There is also a lovely self-contained apartment, on the ground floor with its own separate entrance. The apartment sleeps six and has one double bedroom with an ensuite shower room, a second double bedroom and a twin room plus a comfortable lounge, kitchen and a bathroom with shower. View our Rooms and Make a Booking. Guests staying with us can enjoy a freshly prepared breakfast served daily from 7.30am (8am at weekends). Guest Breakfast Menu. Food is served daily from 12 noon and is freshly prepared using finest quality, locally sourced meat, fish and game wherever possible. View our Menu. At weekends there are usually Chef's Specials on offer and a selection of freshly baked scones, cakes and desserts is served daily. To Book A Table. To compliment your food there is a good selection of sparkling, white, red and rose wines on offer; chosen by the wine experts at Cockburns of Leith. View our Wine List. The hotel has one of the last remaining 'penny bars' in the UK; that is a bar top decorated with one penny coins, some dating back to Queen Victoria. Stocked with popular lagers, ciders and locally produced real ales there also is a fine selection of Scottish malt whiskies and gins. another enjoyable stay, fourth in two years. made to feel so welcome..
Will always use this lovely hotel as a stopover from now on. This is a lovely place. Special place....genuinely warm welcome....superb grub...keep up the good works folks! Everyone so helpful and friendly. "One of Scotland's most important historical figures; a founding father of Romanticism alongside the great poets Keats, Shelley, Wordsworth, Byron and Robert Burns." Greatly celebrated and reveered in his day. There is a plaque dedicated to him in Grayfriars Kirk, Edinburgh; his face is depicted on the Walter Scott monument, Edinburgh and his statue can be seen in Princes Street Gardens. NEW! Ramsay Edinburgh Walking Tour. 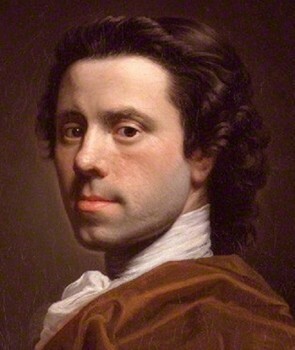 Allan Ramsay's (eldest son (also called Allan) became one of Britain's finest portrait painters. "Ramsay’s eldest son was to become in many people’s eyes, the greatest portrait painter of the eighteenth century." Artist; from age 20 studied in London under Swedish painter Hans Hysing; then in Rome and Naples under Fransceso Solimena and Imperiali (Francesco Fernandi). Painted the great and the good of the time and rose to become Principal Painter in Ordinary to King George III. "His paintings are full of grace and individuality; showing his excellent draughtsmanship". His painting career was ended prematurely by a shoulder injury; from 1770 he concentrated on literary pursuits as became an important figure of the Scottish Enlightenment. 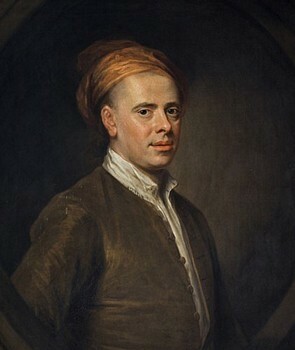 [For more details Allan Ramsay (son) Portrait Painter].